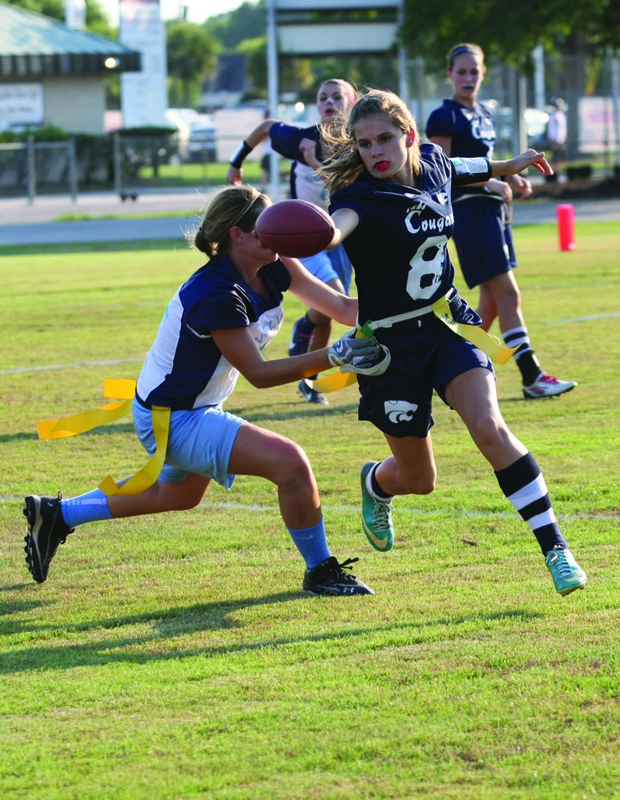 High school girls flag football season has once again merited the attention of fans throughout the county, lining up a number of much-improved as well as experienced championship-bound teams that have been working hard all season, motivated simply by the love of the game. The season’s district 13 final game was claimed by Bloomingdale after a 6-0 win against Durant to earn the program’s first ever district championship. The district showdown brought together four great programs to compete for the coveted title, five of which in the last six-year span went to the East Bay Indians. Number one seed Durant, followed by Bloomingdale, East Bay and Newsome all worked hard during the two-day district games, which at the end produced a new champion. The three-game playoffs began with Durant against Newsome, while East Bay had another chance to overcome Bloomingdale. For the second time in two weeks, the Bulls proved to be a bit too much for the Indians. With a score of 25-6, East Bay lost the opportunity of reaching the championship game, giving Bloomingdale the chance to finally compete in the post season. the roller coaster season, with several close wins and four losses with six points or less, could have gone either way. “With 13 players, nine of whom were varsity rookies, along with six of them freshmen, I am proud of the effort my players put forth,” he said. Having nothing to lose, the Wolves also came out strong and taking the lead early, made the Cougars work for the win. After a 13-0 deficit, the Cougars turned the game around and defeated the Wolves 19-13, which lined up the 2014 district 13 championship game at Bloomingdale High School’s Charley Harris stadium with the two-top seed teams. The Bulls took the six-point lead early, which they held onto for the rest of the game. For more information about East Bay flag football, visit www.ebhsgirlsflagfootball.com. For information about the rest of the region and state competitions, visit www.fhsaa.org.